Lindsay Little Theatre takes a piece of history from a dark corner of Canada’s past and dramatizes its impact through the generations of one family in Homechild. Pam Brohm, Marion Bays, John Cook and Arianna Koty (foreground) star in Lindsay Little Theatre’s upcoming production of Homechild, running April 21, 22, 28 and 29 at the troupe’s 55 George St. studio. LINDSAY – Sometimes the past comes back to haunt us; sometimes it’s a good thing. by Governor General’s Award-winning playwright, Joan MacLeod, running April 21, 22, 28 and 29. 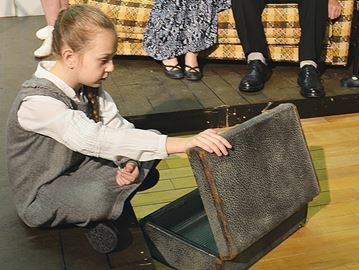 The play is grounded in the migration of more than 100,000 orphans and children who were given up for adoption who were sent from the United Kingdom to Canada between 1869 and 1948 to work as labourers or domestic help. It was believed the children would have a better chance for a healthy, moral life, but while some were welcomed into Canadian families, many were poorly treated and abused. catherine whitnall/metroland – Pam Brohm, Marion Bays, John Cook and Arianna Koty (foreground) star in Lindsay Little Theatre’s upcoming production of Homechild, running April 21, 22, 28 and 29 at the troupe’s 55 George St. studio. < “I’ve always been interested in family history and geneology,” said play director and producer Miranda Warren. “In a way, my grandfather [Rodney Haynes] was a self-made home child as he decided to leave everything behind and come to Canada when he was 14.” Warren wanted to do the play the minute she came across the scrip and was thrilled when the troupe decided to celebrate the nation’s sesquicentennial with a season dedicated to Canadian playwrights. “I think it’s a great opportunity to highlight this time in history,” said Warren. The play takes part in present day, centering on Alistair MacEachern (John Cook), a crotchety, funny and fearless retired farmer who, for 70 years, has silently longed for the sister he left behind in Scotland when he was brought to Canada as a 'home child'. When Alistair suffers a stroke, suddenly these secret memories are unearthed leaving his family to make sense about his ramblings about Katie. For the most part, the cast is comprised of familiar faces including Pam Brohm (Alistair’s sister-in-law Flora), Karin McMullen and Anthony Jackson (friends and neighbours) – Dave Cook (son Ewan) and Marion Bays (adult Katie). Tarina Koty, who tackles the role of Alistair’s daughter Lorna, is not only brand new to theatre, but is also mom to one of the two actors who play Katie as a young girl. Taking a page out of fellow Lindsay Little Theatre director Altaire Gural’s book, Warren decided to double up when it came to casting Katie as it’s a pretty heavy role. “I was nervous that I wouldn’t find the right child for the part,” said Warren who chose Lyra McCann and Arianna Koty from the four who auditioned. Warren noted the role is a great opportunity not only for them both to grow, but also showcase their talents. “They each bring their own uniqueness to the role,” added Cook. Lyra performs April 21 and 29 while Arianna takes over April 22 and 28. As an added bonus to the production, Lindsay Little Theatre has arranged to have author and British Home Children advocate Sandra Joyce for a question-and-answer period after the April 22 and 29 shows. Joyce, who is vice-president of British Home Child Group International, discovered both her father and uncle were sent to Canada as home children. 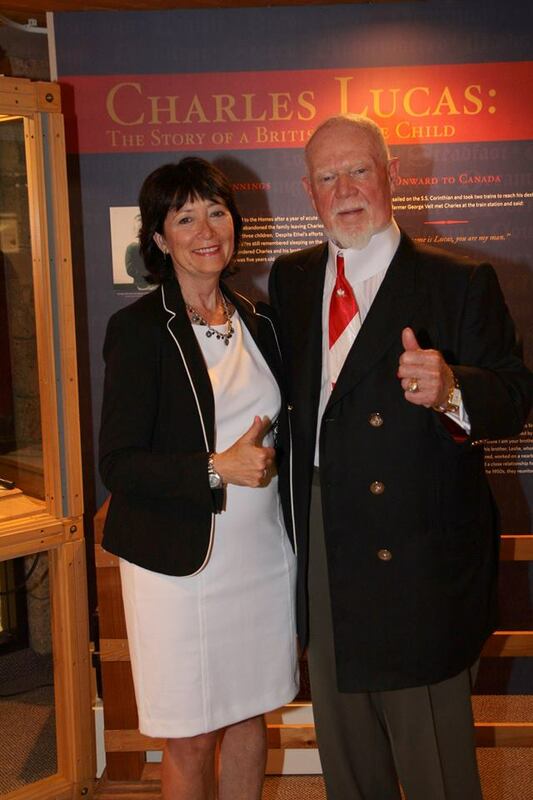 She was instrumental in the British Home Children receiving an official apology in the House of Commons on Feb. 16. Show time is nightly at 8 p.m. Tickets for Homechild are available from the Academy Theatre for Performing Arts box office, calling 705-324-9111 or via www.kawarthatickets.ca. Sandra Joyce, a Toronto writer known for helping to facilitate an official apology for the actions of the British government in sending more than 100,000 children to Canada, is taking her story to Sarnia Tuesday evening, when she will speak to the monthly meeting of the Sarnia Historical Society at the Sarnia Library Theatre. The free presentation begins at 7:30 p.m.
Joyce, a published author, has become a well-known advocate on the issue since she realized her own family connection in 2004. The British Home Children scheme, which was initially motivated by social and economic forces, saw churches and philanthropic organizations sending orphaned, abandoned and pauper children to Canada and other Commonwealth countries between 1869 and 1932. While many believed that the children would have a better chance for a healthy, moral life in rural Canada, families here often welcomed them as a source of cheap farm labour and domestic help. Unfortunately, as Joyce found when she discovered her own father and uncle were sent to Canada from Scotland in 1925, the scheme often resulted in families being separated. The program also resulted in children facing malnourishment. Since bringing the issue to the forefront through her book, “The Street Arab,” Joyce has spoken with numerous descendants of the British Home Children era. She her self was instrumental in securing an official apology to British Home Children in the House of Commons, which was issued on February 16, 2017. Joyce said she regrets that her father didn’t have the opportunity to tell his story. She hopes to pass on what her father “was too ashamed” to reveal about his experience. Joyce found about her father’s experience by typing in his name into a database at the Canadian Museum of Immigration at Pier 21 in Halifax, N.S. That was in 2004, two years after her father had died. More information on the issue is available at http://britishhomechild.com/. British home children advocate Sandra Joyce is pictured here after the House of Commons issued a formal apology to these children who worked in Canada as indentured farm workers and domestics. 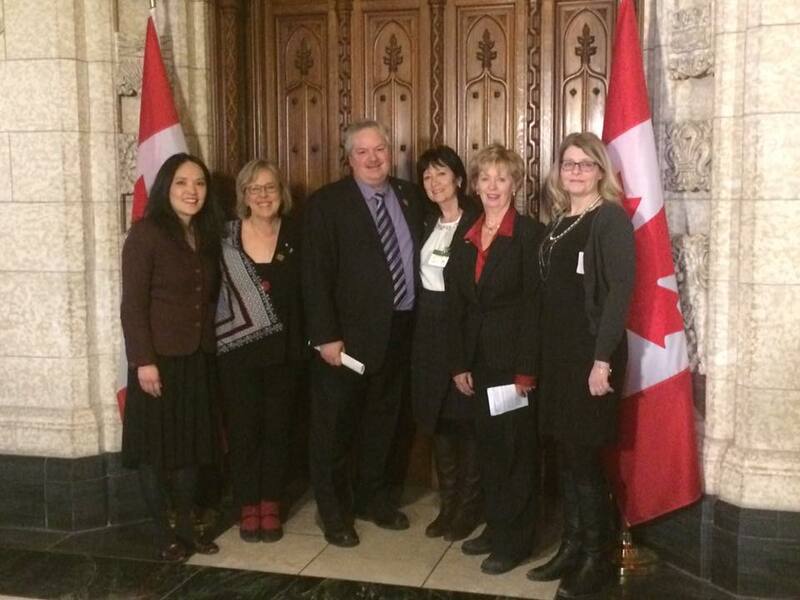 Pictured here, from left to right, are NDP MP Jenny Kwan, Green Party leader Elizabeth May, Bloc Quebecois MP Luc Theriault, Joyce, Liberal MP Judy Sgro and Karen Mahoney, president of British Home Children Group International. Sandra Joyce had to uncover a secret her father held for close to 80 years in order to find the family she had always wanted. The Toronto-based writer – who was raised by two British ex-pats – grew up without any contact with her father’s family. She was told she had an uncle, but that was it. Ultimately it would take a visit to the Canadian Museum of Immigration after her father’s death and hours of research to find the full story: her father had been a British home child, plucked from his family in 1925 to come to Canada to work in the fields of Ontario. Joyce has since met her paternal first cousins. She even stayed in the Tower of London with a first cousin who is the tower’s only female Beefeater. Joyce is now on a mission to help other descendents of British home children find their lost families scattered across the world. For more than a decade, Joyce has travelled across Canada to share the stories of these often-forgotten child labourers and provide support to their families searching for lost loved ones. She has also published a series of novels based on the experiences of British home children. Joyce recently helped secure a formal apology to British home children from the House of Commons. Joyce will share her family’s story, as well as her years of research on British home children, at the Sarnia library theatre April 11. Joyce last visited Sarnia in 2012 – a community where she says “quite a few” British home children were sent to work. More than 100,000 children are believed to have been sent from Britain to Canada to work as indentured farm workers and domestics from 1869 into the 1930s. These children – either orphaned, abandoned or poor – were sent to Canada by British churches and philanthropic organizations. Some children were as young as four, and often times, siblings would be separated from each other. In 1925, Joyce’s father Robert was sent to Canada at the age of 15 along with his 12-year-old brother Thomas. They were sent to different farms in Ontario, and despite efforts to connect through their receiving home in Brockville, they never reconnected. Along with separation anxiety, Joyce said some British home children also had to grapple with abuse and neglect because once children were sent to Canada, it was the “luck of the draw” as to the conditions they would live in. Joyce’s father Robert was ultimately released from the program at the age of 18. He moved to Toronto and eventually became a supervisor at Seaton House, the largest men’s homeless shelter in Toronto. Robert went on to marry a fellow British ex-pat and then started a family of his own. He died at the age of 93 in 2002. Two years later, Joyce found his name on a passenger list at the Canadian Museum of Immigration in Halifax. 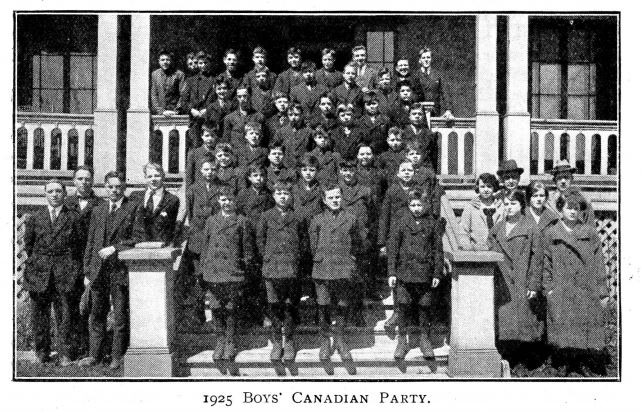 Robert was part of a group of children who emigrated to Canada at the time – a fact that left Joyce searching for answers. “At the time, I said, ‘Why don’t I know about this story? It would have made such a big difference in our lives as a family if we had known this,’” she said. During that era, Joyce said society was wrapped up in a discussion about eugenics because people at the time thought poor children were the offspring of degenerates. Looking back, Joyce said she can see how that – along with the fact her father came to Canada with few possessions – formed his lifelong need to always be financially secure as an adult. Joyce said the plight of British home children is a story shared by all Canadians. Welcome to my website, SandraJoyce.com. This is the place to learn more about the books I have written, projects I’m working on, future speaking engagements, and my ongoing efforts as part of the British Home Child Group International.